An expensive law firm that deals with the disgustingly rich and the horribly evil. 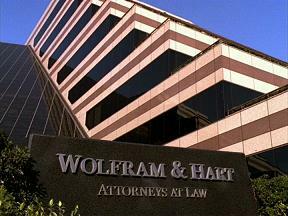 Sleek and stylish, Wolfram and Hart is state of the art in everything. The security is always watchful to keep the riff raff and anyone without a proper appointment from entering. The large, open lobby is filled with windows and cheery sunlight is in sharp contrast to the business that is down on the upper floors. Once past security and various other checkpoints, the decor remains bright and welcoming, but the atmosphere lends to something more cutthroat. It's not uncommon to see many different species walking the expensive carpets and hardwood floors as both employees and as clients. The conference rooms are huge and filled with plush office chairs and long tables. The offices of the higher ups are even more luxurious. Long hallways are filled with doors that lead off to the varying departments with names like Corporal Acquisition and Prophesies and Harbinger Division. To the evil and the rich, these lawyers can get anyone out of just about anything. Of course, they always come a price.